I stumbled upon this ice cream shop on a hot summer day and was initially drawn in by the interior design: Portuguese tiles, industrial chic concrete bar, very tidy. “This must be good”, I thought! It turned out that their ice cream had no problem keeping up with my expectations. 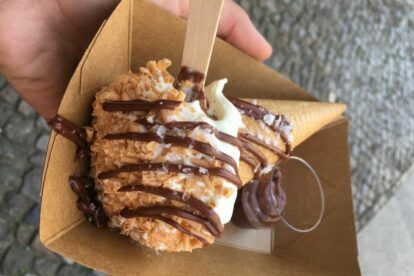 At Paul Möhring soft-serve ice cream is paired with exquisite and sometimes crazy toppings. There are two “bases” – vanilla and chocolate ice cream – and all sorts of interesting additions, for example Valrhona chocolate sauce, raspberry balsamic vinegar, wasabi pea dust and many more. These can all be ordered separately or to make it quick you can choose one of the suggested combinations, for example “Camp Fire”: Burnt marshmallows, cookie crumbles and chocolate sauce or “Salty Dude”: butter caramel sauce, fleur de sel and hazelnut brittle. It is definitely worth visiting Paul Möhring in the colder months as well. They offer a couple of hot drinks: coffee, home made chai tea, hot chocolate and mulled wine and will surprise you with the most delicious cakes.